Video social networks are attracting lot of teens now a days. People want to show their talent like acting, lip-syncing, dancing, singing, etc. to the whole world. So, Apps like Tik Tok helps them to express their feelings in unique way. These video maker apps allows you to record videos from main camera as well as selfie camera. After that you can edit your video with beautiful filters, cool effects, stunning stickers, and other add-ons to make it awesome. In earlier days, it was difficult to edit the videos we shoot. There were no good video editor apps to edit our videos. When Dubsmash came in the market, it became so popular among people to lip-sync dialogs of movies. But at that time Dubsmash app was not providing option to edit videos with filters, effects, stickers, etc. So, people ran towards new app named musically. Musically covered the great video editing features and added lip-sync of popular songs. People loved those concepts and musically app became viral in very short time. Later musically was acquired by Chinese company ByteDance and they merged Musically with Tik Tok app. Tik Tok app is trending now all over the world. It’s not only video editor app but also gives you platform to post your videos to show your talent to people like you. These type of apps called video social network. Yes, as people can post videos on their profile, follow other people, like, comment & share the videos. That’s why popularity of video social networks is going up and up. If you are using Tik Tok app only then you should not limit your editing skills. You should show your talent on other video social networks also. 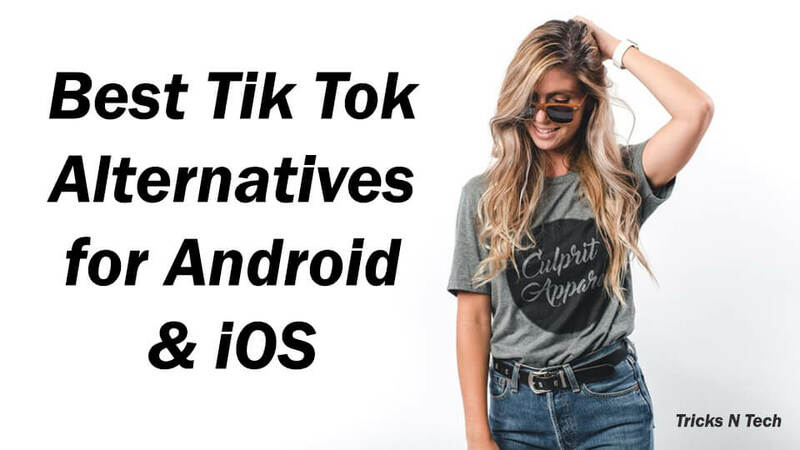 So, Let’s see Best Tik Tok Alternatives for Android and iOS. We have found some apps that you can use in place of Tik Tok. In fact, many people who are using these apps are not using Tik Tok. Surprised right? But it’s true. So, Check Best Apps like Tik Tok below. As Dubsmash came into the lip sync video market first, we have to put it on top. At earlier stage, you just able to to lip-sync on popular dialogs of movies and TV shows. But it’s totally updated now. Now, you can add music, quotes or sounds to your video. Dubsmash has the world’s largest library of Sounds including new movie quotes, best TV quotes, fun musical sounds, etc. Even you can add your own sounds to dub with it. You can watch best dubs from the Dubsmash community and can redub it. They are running different challanges also like Mannequin Challenge and JuJu on That Beat. To make your dub more attractive, you can edit it with text and cool stickers. So, Are you excited to download this lip sync app? Then install it on your Android or iOS device now. LIKE is India’s most popular video sharing community. The app provides trendy lip-sync music videos, video status, dance performances, entertaining shows and much more. LIKE provides video editing tools with 300+ unique magic effects and good collection of Bolllywood, Hollywood, European pop music clips. It also provides music, movies and drama dialogues from Bollywood, Tollywood and Kollywood. You can make friends nearby to you and can perform duet with talented people from all around the world. You can record and edit videos with face emoji stickers, variety of filters, magic music filters, touch magic graffiti, 4D magic, AI powered superpowers, etc. video editing tools. Even if LIKE is alternative of Tik Tok (Musically), it provide option to share your videos directly to Tik Tok, Snapchat, Instagram, Whatsapp, Facebook, Twitter, Youtube, and other social media sites. Give a try to LIKE. Vigo Video is short video maker app where you can make funny short videos easily. You can show your talent like singing, dancing, comedy, cooking, art, beauty, etc. to the world in just 15 seconds. That’s cool. You can add special effects & animated stickers to make your video more catchy. They have realtime beautify camera which can magically smooth out your skin, even out skin tones, remove the blemishes, and enlarge your eye while recording. Even you can do live streaming for your followers. You can meet people who have similar interests in your area or around the world. Collaborate with people you like and increase your followers. They promote your video with right people so that your can get more reach. The best part is they gives you flames if your video get enough views, likes and comments. You can convert those flames in real money and can redeem it to your bank account. Yes, It’s true. You can earn money by simply making and posting videos on Vigo Video. Download vigo video and share it on Whatsapp, Instagram, Facebook, Twitter or any other social media. Kwai is one of the best video social network. Here you can gain millions of fans around the world and can get reward and cash revenue. With Kwai, you can edit video with 4D motion effects, animated filters, dynamic stickers, different text fonts, etc. It have video editor tools like trim, cut, crop, merge, stitch footage. You can do lip sync to your favorite movie scenes, songs, dramas. You can add popular and latest music to make an awesome music video. See hot trending videos, comedy & prank videos, lip sync & dubs, fashion & beauty, singing, dancing, magic and much more on your personalized video feed. They regularly hosts fun challanges, dance battles, and special events. You can share the kwai stories that can last 48 hours. Just like other apps you can collaborate with others and can build your network. So, Start creating short videos with Kwai on iOS and Android smart devices. Funimate is used to make awesome music video clips, lip-sync videos, slow motion videos, and much more. They have more than 20 cool video effects, hundreds of emojis, funny stickers, texts, to edit your videos. Funimate also provides facility of merging, trimming, cutting, and editing videos. You can collab with your friends on Funimate video maker. They gives daily challenges in the app. So, you can show your talent with completing challenges to get featured on Funimate. It will increase your followers and popularity. Funimate also provide facility to share videos privately only with your friends and family via Whatsapp. If you want to loop the short video then it can be done with Funimate video edior. So, to get more likes and comments on Youtube, Tik Tok and Instagram edit your videos with Funimate available for iPhone, iPad and Android devices. Triller is used to create awesome videos, shoot beautiful films, make celeb-quality music videos, and collaborate with friends to make videos in few seconds. You can easily create professional looking music video using their unique auto-editing algorithm. If you want to post story in Instagram or Whatsapp with singing, acting, dancing with unique style then Triller will help you. You can adjust, crop, trim and edit videos with effects, filters, drawing, text, emojis to make video more beautiful. Make group video with collaborating with your friends. Like, comment and follow talented people around the world and chat with them too. Millions of people have made videos on Triller including celebrities like Selena Gomez, Justin Bieber, Rita Ora, Kevin Hart, and more. So, What are you waiting for? Make your own music videos with Triller. Lomotif is one of the best music video editor for iOS users. They launched the Android version also and it’s gaining popularity slowly slowly. With lomotif, you can add music, join video clips, add photos, make collage/montage and many more thnigs. Lomotif provides facility to crop, trim, cut, duplicate, zoom in-out, etc. with built-in video editor. You can add title and text overlays to your videos. Also you can add filters, animated stickers, emojis and GIFs to your video clips. Hyperlapse and slideshow of photos covered in the app as extra features. You can join lomotif community to get trendy videos, find friends, collab with friends and other cool things. To make video on special occasions, you can find songs for “Birthday”, “Best Friend”, “Anniversary”, “Romance”, etc. easily. After making video from Lomotif you can share it with one click on Instagram, Snapchat, TikTok, Facebook, Messenger and other social sites or chatting apps. Install Lomotif Music Video Edior now. Cheez is easy to use video maker app. You can use editing tools to trim, merge, cut, and duplicate video clips. Music videos, dance, lip-sync, etc. things that all video social networks are providing also included in the Cheez app. Well best part about this app is they give rewards to video maker if their videos get enough views, like, comments and shares. Even they compensate the audience by watching, liking, commenting and sharing other people’s videos. That’s really cool. Participate in daily battles, challenges & dance off and you can win real money. You can make videos on top categories like comedy, prank, singing, dancing, acting, lip-syncing, vlogging, fashion & beauty, animals, etc. or you can watch others videos on your feed. So, if you are looking for the app like this then try it now. Firework is new app in the market of short video maker but it’s impressive. You can explore video feed to get entertainment from latest dancing craze to unique talents shared by musicians, artists, comedians, athletes, singers and more. With their easy creation tools and simplified design, you can edit your video quickly and easily. You can participate in weekly video challenges to win amazing cash prizes. Find and join the viral trends with your unique style. Even you can be the trend among the firework community as they promote the video based on it’s quality, not on the number of followers. You can collab with the other people around the world. So, Install Firework and share your sparking videos with your friends. We have seen best tik tok alternatives for Android and iOS devices above. So, If you are tired of using TikTok (Musically) then these apps are same like Tik Tok. Even some of them have very good features that TikTok don’t have. While some of the video social networks are giving cash prizes. So that you can earn money same like earning money from the YouTube. All the apps are really good. So, you can download them according to your need. If you are using any other apps like TikTok then comment it down below. Share these top tik tok alternatives with your friends to make awesome videos with them. 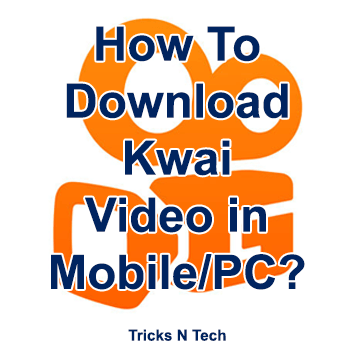 How To Download Kwai Video in Mobile/PC?